Now, I very much disagree with the genral disapproval of the ending that has become the ongoing criticism chorus of the film since its Oscar nomination and subsequent win. I think the ending is perfect. But what I really don't understand is how you can give a film with such an unsatisfying ending for you four stars? A wonderful movie. The “Minnesota nice” of Fargo was replaced with “Texas tough”, especially in Tommy Lee Jones’ character. 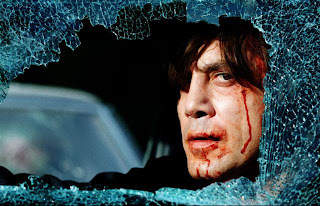 Javier Bardem was creepy and scary as the cold blooded killer. Josh Brolin and Kelly MacDonald were very believable. I loved this movie and I’ve been a fan of the Coen brothers since “Blood Simple”. I thought the ending was enigmatic which fit in with the rest of the movie. Really were the events portrayed understandable in a real life perspective. The killings and drug money are common in cinema and maybe we’ve become immune to the shock of murder. Did any of the killings, especially the last one, make sense. Wouldn’t Marge Gunderson wonder if all this mayhem was worth it for "for a little bit of money." I think F. McDormand and Tommy Lee Jones characters are completely different. Marge was very active, and acute, Bell was always a step behind and as the title suggests too old to compete with Moss and Chigurh. I wasn’t comparing them. It’s just that all of the mayhem in both movies came down to a little bit of money.